"I sustain myself with the love of family." There's evidence of subtle seasonal changes. Burnt orange leaves spatter tree branches. Some litter the ground. Mornings begin chilly, warming as the day progresses, then giving way to cool evenings. Autumn enthusiasts boast their cheer with festive wreaths and pumpkins and warm colors. And yellow buses vroom down streets once again. Summer is fading, and in its place comes a season with a different pace. But before this shift to a structured life rolled around, we loaded up the van and set out on one last hurrah. Destination: lake house. Nestled on a private drive lined with a handful of fancy houses overlooking Pelican Lake sits a small house we made our home for a better part of a week. And on the last day just before we were to leave, we walked room to room, saying our farewells. Good-bye, Ashton's room! Good-bye, Spencer's room! Good-bye, den: you made us feel fancy! Good-bye, huge shower! Good-bye, sweet, sweet patio with the comfy chairs perfect for reading during nap time! Good-bye, Alvin and Simon and Theodore: we will miss you, chipmunks! Good-bye, dock and lake and beach! Good-bye, house! It was in the room Ashton claimed as his, after hugging the plush singing Rudulph and playing the song one last time, that Ashton's lip began to quiver and tears slowly streamed down his cheeks. "I'm going to miss this house," he cried. We all agreed. This particular lake house will go down as our very favorite, I am almost certain. We spent most of our time at the house, indulging in lazy mornings on the beach that segued to lazy afternoons on the beach and ended with lazy evenings around a bonfire on the beach. But sometimes we ventured away from the house and its inviting beach backyard, taking excursions to nearby destinations. One morning we picked raspberries on a berry farm. This particular activity was enjoyed most by Jillian, who shoved berries into her mouth faster than we could fill the buckets. We also spent a great chunk of one day at Paul Bunyan Land--a small amusement park and pioneer village. As a family who steers away from crowded, busy attractions, this place was perfect for us. The kids delighted in the rides and junk food and the "very first park" we found hidden in the pioneer village. Although our adventures away from the lake house were fun, we definitely preferred being at our temporary home. The boys were in a constant dress of swim trunks and beach towel capes, going in and out of the water. Ashton's broken arm made the water play a bit trickier as the cast had to be first wrapped with seran wrap and then wedged into a rubber waterproof cover. But he didn't let it deter him much. Jillian claimed a spot on the waterfront where a patch of rocks were missing from the rock wall, allowing her to perch in the shallow part without wading out too far into the lake. Spencer stationed himself at the end of the dock, tackle box and leftover hamburger buns at his feet, as he casted his line over and over. 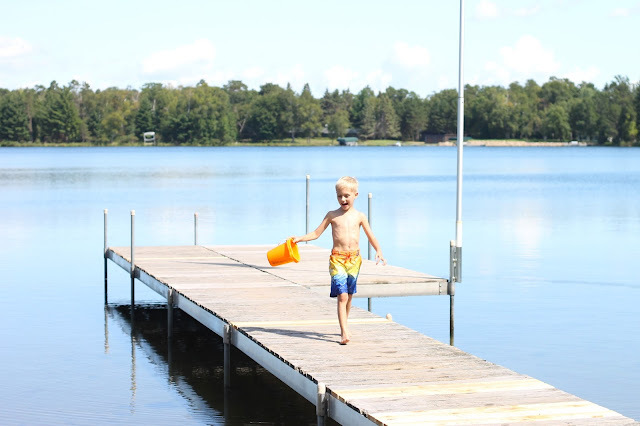 As we settle back into the structured life of alarm clocks and school buses and homework and after school activities, it's hard not to reminisce about our long weekend at the beloved lake house. Soon it'll be but a distant memory as all remnants of the dying summer have passed, but we will always remember our time there. Good-bye, lake house: until we meet again. Gorgeous photos and beautiful words. Thanks for sharing. The Lake House looks devine and the perfect getaway.